The shell of quail eggs in its composition contains a lot of nutrients. Calcium carbonate, which is almost 90%, is easy to digest. Also in the quail shell, there are 27 different minerals, the main of which are: iron, fluorine, zinc, copper and others. That's why it's so useful, especially for a growing child's body. The shell of quail eggs can be taken not only children but also women during pregnancy; people suffering from brittle bones; teenagers and young people up to the age of 18-20 years and other categories of persons with disorders of calcium-phosphorus metabolism. Also desirable reception of the shell in winter, when all the metabolic processes in the body slow down. To cook rich calcium powder in several ways. The simplest of them: clean and dry the shell, grind in a coffee grinder, then eat the resulting flour, plenty of drinking water. To calcium is better assimilated, add to the powder, obtained after grinding of the shell, three to five drops of lemon juice. Mix the flour so that the lemon juice gets evenly distributed, and then eat the resulting mass. During the reception, the shell of quail eggs I more often in the sun or drink fish oil. Vitamin D, which is contained in it, is also necessary for calcium absorption. Eat the powder of eggshell quail eggs at any time convenient for you. Reception performance does not depend on when the active components into the body: before meals, during or after. Babies under one year every day, let half shell quail eggs, children 1-7 years shell the whole egg. Younger children and teenagers is enough of the shell from two eggs and adults from three. 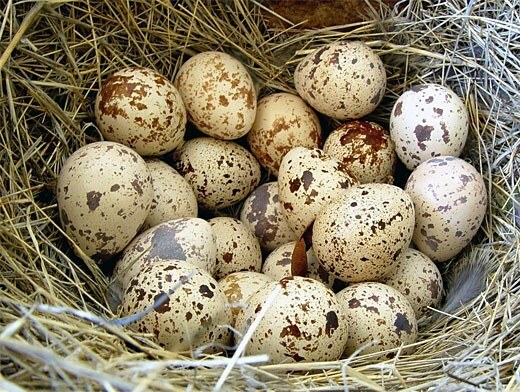 If you have trouble receiving powder from quail eggshell, prepare useful calcium solution. In a quart jar with room temperature water pour a teaspoon of powder prepared from the shells, mix thoroughly, and then allow the liquid to steep for 5-6 hours. Use this water for making tea, herbal decoctions and infusions, fruit drinks and soups. It is easily absorbed by the body and replenishes the calcium, iron and other essential trace minerals.